On a Saturday afternoon there was nothing better than devouring a big bag of Skittles whilst tuning in the latest wrestling action from across the pond. Despite numerous warnings and messages not to repeat the moves you see on TV, impressionable children still tried to piledrive and suplex each other on the parents bed much to the disdain of parents all over the country. So thank goodness when Acclaim and the WWF linked together to create video games based off the heroes that were seen on screen each Saturday. Although there were other wrestling games at the time, the chance to play as our favourite heroes was an opportunity not to miss. The first licenced game released was WWF Wrestlemania, back in 1989, so after 24 years does this game deserve a gold belt or to be beaten into submission? WWF Wrestlemania is, as common sense may dictate, a wrestling game giving the player the opportunity to play as 6 licenced characters from the most famous wrestling organisation out there (and not the WWF charity, a confusion made clear years later) and fight till the death. Or rather the 3 count bell rings. You can choose to play one off matches or compete in a tournament facing off against the other 5 opponents in order to be crowned the champion. The characters to select from are: The Million Dollar Man TedDiBaise, Bam Bam Bigelow, Honky Tonk Man, Randy “Macho Man Savage”, Andre The Giant and Hulk Hogan. Certainly makes a difference than playing as King Slender or as Star Man. Turning on the game your greeted with the option to select the number of players you wish to have participate in the game. If you are by yourself or with a friend, for 2 players you can choose to play one-off matches or compete in a tournament. If you have 3 or more players you can only compete in the tournament. There is no tag teaming games or steel cage matches, just mano y mano in the ring. You then get the chance to enter your name, which is quite useful unless your name was Gertrude or something longer than 6 letters but you could abbreviate to Gertie right? Who wouldn’t want to play with a Dirty Gertie?… Anywho deviating slightly, after entering your name you then choose your wrestler from the 6 listed and your then ready to fight. Usually at this point is where I would say the A button does this and the B button does that, however bearing in mind it’s a wrestling game the best way to experience the game is to mash buttons, in different combinations in order to win. There is something satisfying in just mashing the buttons without thinking, and having to worry about strong grapples and weak grapples and pressing a million different combinations to inflict damage. Bearing in mind the limited number of buttons on the controller, moves are restricted to basics however the developers did try to do the best with the limited options you have. Characters have their standard punching, kicking and headbutt moves, but as well each character can perform a “back attack”, kind of similar in Double Dragon where you can attack where your back is turned. It’s also worth noting that characters can perform an aerial move from the bottom turnbuckles only, and some characters perform moves unique to them, for example Randy Savage can perform elbow smashes rather than normal punches which is a nice touch customising the characters rather than just colouring in different pixels, calling them different but having the same move set. In the game as well you may stumble across icons that go from left-to-right across the screen so do collect them as it improves your health bar on the screen helping you last longer. 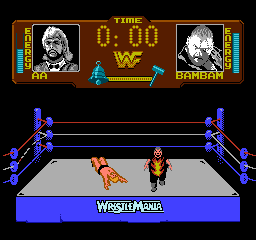 The icons differ for the differing characters, again Bam Bam Bigalow has a fire icon go across the screen, and these icons can only be used by the specific wrestler, so Hulk Hogan cannot collect the item for Bam Bam. Graphically, the game is set upon a black background so there’s no crowd cheering you on, and does seem quite simple. They did do well trying to recreate the faces of the wrestlers which are displayed on screen but the colours are very simple and do not inspire. That’s not necessarily a bad thing as there’s always a debate that gameplay should outweigh graphics but as mentioned the graphics won’t tantalise or tittilate. The music although upbeat doesn’t seem to quite fit the gameplay, in menus it’s fine but in game the noise of the crowd and the sound effects of fighting should outweigh, but no the music repeats on a loop in game. Due to limitations the character’s theme music isn’t heard at any point in the game which is a shame but is understandable but it would have been nice if there was some effort put into the music. As well the sound effects do sound as if they were ported directly from the Atari which given this was in the last year of the Eighties, more effort could have been made. 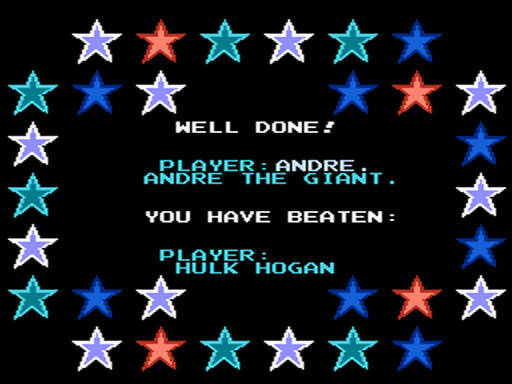 So overall, WWF Wrestlemania was a forgettable debut for WWF games on the NES console. It’s a shame as kids growing up on the WWF would have rushed the stores parting their parents cash so quick knowing they could fight as the heroes they see on TV, but aside from button mashing there’s no grace or elegance in the game. Yes it’s nice that 6 people can play on the one cartridge but the developers could have put more effort into this game to make it more memorable. Given that 2 years prior to this game being released, Pro Wrestling was released in Europe and was a much better effort without the usage of the characters, so that could have been a benchmark to improve on but sadly it wasn’t. Wrestling fans may want to add this to the collection for nostalgia sake, to see how the genre has moved on from the beginning here to what is on offer now but for the casual fan, my advice is to pick up Pro Wrestling instead, and pretend its the WWF superstars instead.